I’d heard about this particular corporate office, but thought the rumours just couldn’t be true, afterall, nothing could be that bad! So with a certain feeling of uncertainty, I mustered up the required courage and walked with some trepidation through the entrance of the building to my scheduled appointment. As I walked through the automatic opening and rather imposing glass doors each of which boldly portrayed the company’s famous insignia, I heard a quiet woosh sound, and sensed that a small quota of my innovation can been surreptitiously sucked out of the pores from a skin. A slight feeling of fear started to permeate through me! I waited in the reception area for my host to arrive and noticed that the office was devoid of colour, all employees were dressed in dark ominous tones of corporate boringness and the walls were blank canvasses of white with the occasional random poster of business repetition. A drop of sweat now slowly meandered down from my forehead…this was not looking good! After waiting about five minutes completely immersed in silence as no one appeared to laugh, smile or have any normal facial expression that had a glimmer of hope or inspiration, my host finally appeared. My host was the CMO. He was dressed in a traditional dark suit, white shirt, rather bland yet expensive tie, black polished shoes and reeked of that rather common aftershave. My internal innovation meter sensed impending doom and urgently started to seek an exit from this place of potential creative tyranny. I noticed a prominent button protected by thick glass on the wall that was fully coated in dust and cobwebs which read “break in case of innovation emergency!” This was indeed such a situation! I excused myself from my host, ran to the button, smashed the glass and eagerly pressed this button of hope. What happened next….well that is a choice that all you who are reading this blog post can make! All of us have the choice to work in a corporate environment that is bleak, or one that inspires and cultivates innovation. If it is the former, then why not implement a culture of innovation change…it could be fun and quite stimulating for all concerned! 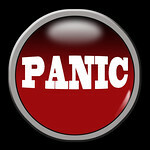 If you are in any doubt, may I suggest you place an ‘Innovation Panic Button” on your office wall and then quietly observe just how many employees try to press it? I think that you will be surprised at the number of people who desperately seek that innovation cultural change and the associated benefits that are derived from it! Could be an emergency bow tie dispenser.